This sauce. THIS SAUCE. Okay. Let me back up for a sec. 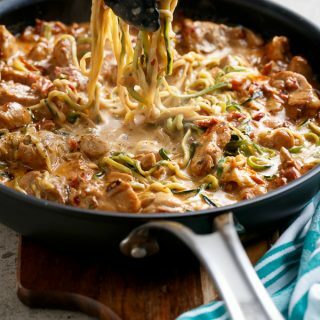 Sun dried tomatoes and garlic and parmesan cheese infused in a cream based sauce, enveloping crispy, golden pan fried chicken strips and zoodles for the craziest low carb comfort food. However, if you don’t have one..or can’t find one, you can make fettuccini style ribbons with a normal vegetable peeler. 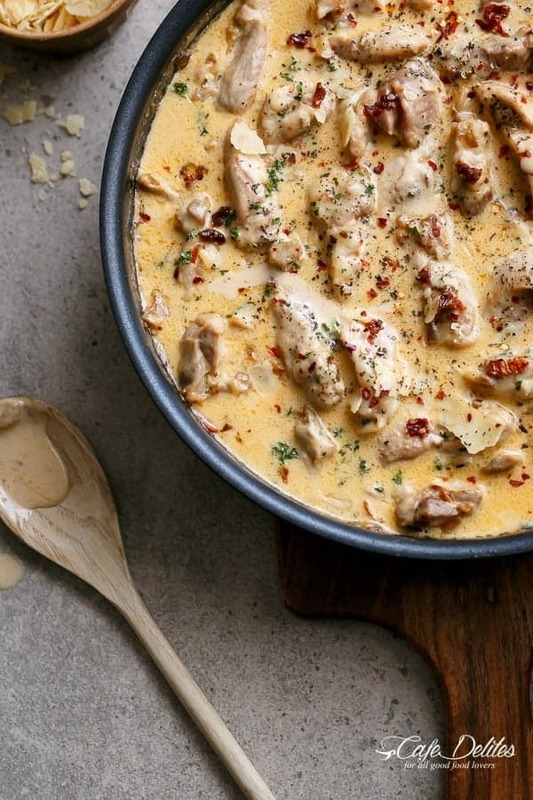 With minimal ingredients, a beautifully rich and creamy sauce is ready in less that 10 minutes with the extra addition of extra sun-dried tomatoes, a tonne of parmesan, red chilli flakes and dried basil. 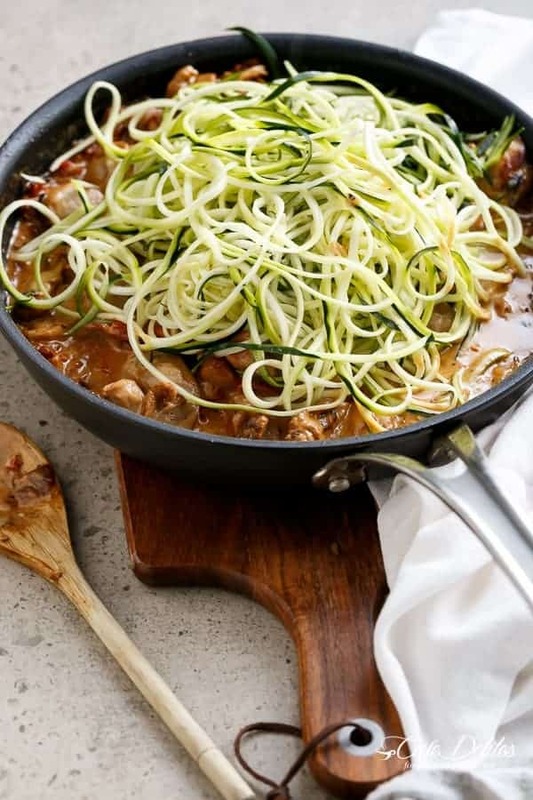 Simply add your Zoodles for a healthy take on pasta (or add pre-cooked pasta if you like), and dinner is done! Serve this, and you’re family and friends won’t miss pasta. They won’t even be mad at you. 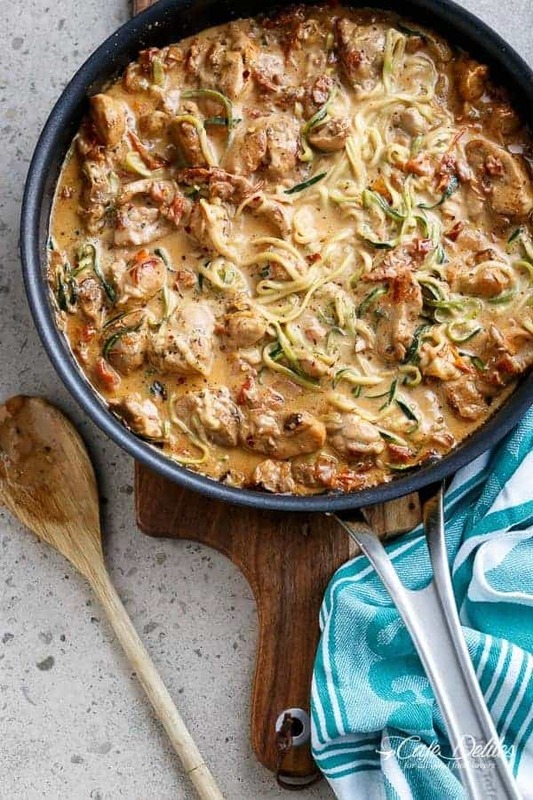 Sun-dried tomatoes and garlic and parmesan cheese infused in a cream based sauce, enveloping crispy, golden pan fried chicken strips and zoodles for the craziest low carb comfort food. Weight Watchers: 10pp per serve! 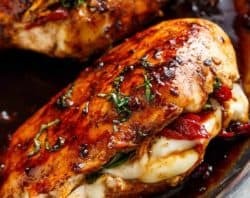 I came across your website yesterday whilst searching for low carb dinners and decided to make this dish. I wasn’t too sure about so many sun-dried tomatoes but WOW this dish is absolutely delicious!! I just used the sun dried tomatoes in oil from a jar as I couldn’t find the semi dried ones and I also substituted the cream for mascarpone cheese. 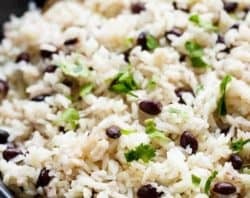 This dish is super easy to make but is restaurant quality. Feeding a family of four is never easy but this was voted a real winner by all. If like my family you have a good appetite, add extra chicken! I subbed in 2 bags of shirataki noodles instead. I drained and cooked the liquid out in a different pan at the same time as the chicken. This recipe was so good and I’m sure it’ll be good when zucchini is in season where I live. This was ABSOLUTELY DELICIOUS!!! Very flavorful, you can’t even tell it’s not a dish at a fancy restaurant! I added extra red pepper to spice it up, and a tbsp of cream cheese! Definitely making this again. I already can’t wait for lunch leftovers tomorrow! Lol. Thank you so much for sharing/creating this delicious recipe! P.s. I also bought already-spiralized zucchini sold in the coolers at target cuz 1- I was lazy, 2- it was my first time to try “zoodles” so I didn’t want to buy a spiralizer yet 3-I wanted to test out what the prepackaged ones would taste like if I’m in a rush in the future again lol. This is an amazing recipe. Second time making it tonight and tried it with sweet Italian sausage. SOOOO GOOD!! I’ve been on the keto diet for a week now and have been DYING for some good pasta. Zoodles, and this recipe, have CHANGED MY PERCEPTION OF PASTA FOREVER. YAY!! That is great to hear! I am so happy for you! Way to go! Keep up the great work. Thank you for following along with me! 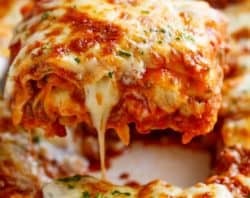 Helloo i just found recipe last night an i said to my hubby im going to make this. So tonight i made it an its one of the best things ive ever made it is sooo yummy yaahh go me lol. Thankyou so much for sharing ? I had this recipe saved in Pinterest for a couple weeks, and just made it a short while ago. Absolutely delicious! My boyfriend, who doesn’t like vegetables and was a little skeptical of zoodles, LOVED it! Thank you! That is so great to hear! I am so glad that you loved it and are sharing it with your family! Thanks so much for following along with me! Sun-dried creamy parm chicken is good. We left out the chili flakes and added mushrooms and onion. Turned out great…..don’t really follow recipes too much but everything together was good! OH my this was amazing! I followed recipe exact but I think I got it a bit too salty but still good! My husband and I are going low carb and the zoodles are a hit with my pasta loving man. In my opinion def get a spiriliser it’s worth it! Could you use half fat creme fraiche instead of cream or half and half? I made this a while back and substituted the cream for cottage cheese and a little milk. Upped the protein and it was still creamy and delicious. Even the kids ate it. I did risk my life using and old school v slicer as I don’t have a zoodle maker, but it still worked out well. Making it again tonight! I printed this out and after making it the first time, wrote ‘YUM!’ at the top of the page. Now that’s what we call it as in ‘shall I make the YUM tonight?’ And I make this a lot. Quick and easy enough for everyday, but tasty enough to be company worthy. And the company loves it as much as my family does. They are learning that I do not suffer on my low carb diet. Many thanks for the recipe. Made this tonight with my new spiralizer and it was so good!!! I did cheat with the sauce and added a jar of Classico four cheese Alfredo and a little light cream. Also dried all my “zoodles” with paper towels before putting them in the sauce and didn’t water it down at all. Came together so fast for a weeknight so I was happy!!! Thank you so much for sharing!!! This was delicious and EASY. Nice not to have to cook separate noodles/pasta so it’s even simpler! Unfortunately I thought the recipe was for four and ended up eating too large a portion. ?I knew it was too good to be true! LOL Next time I would serve smaller portions with a salad on the side. My kids loved the chicken and the sauce (unfortunately my 7 year old didn’t like the zucchini…must be the texture!). I didn’t have enough zucchini so I added some drained shiritaki (tofu) noodles and it was perfect! Just make sure they are rinsed and dried well! I made this tonight and it was amazing! My husband was very sceptical, but he loved it as well. A definite hit at our house! Once I added the zucchini, it becomes really watery and not thick and creamy as it was before. Any suggestions? Hi Meghan! I’m sorry that happened to you! Is it possible you left it too long simmering? If left too long, the zucchini will start to release water into the sauce. I made this last night and it turned out amazing. Satisfied my pasta craving without the guilt! Dang! This is seriously good. Thanks for a stellar recipe. Makes going keto so much easier! Super excited to try this tonight. I see that you have the WW points listed for the old program (PP). Can you tell me how much it would be for the new program (Smart Points)? I played with the numbers and I got 7 Smart Points. Do you think that is correct? We made this tonight, it was our first time using our vagetti. AMAZING!! I am a pastaholic, but I think after tonight I will never eat pasta again!! 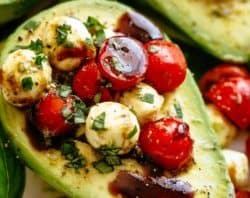 We had this with papadew peppers drizzled with a balsamic reduction, which ended up being amazing mixed in with the sauce!!! I can’t wait to try this! It looks positively delicious! 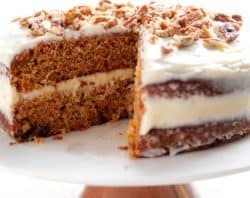 I featured your recipe in my Coffee Cafe post over the weekend. Have a great day! 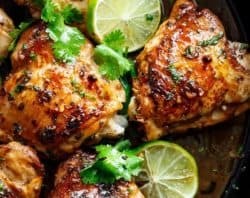 I’m looking forward to trying this recipe tomorrow night! Can you tell me how much constitutes one serving? Hi Rebecca. It’s hard to say as I don’t measure serving sizes in cups or grams. I usually just divide it into the numbered servings for my family. Maybe close to 2 cups if I remember correctly. Thank you for sharing. Super yummy meal!!! This was delicious and so easy to make! My husband said to add it to the list of our favorite meals. I didn’t have zucchini, so made angel hair pasta. I made this for dinner tonight and it was absolutely scrumptious!! First time making zoodles was a success! Could you substitute Greek yogurt for the cream? If so, how much would you use. Thanks! Hi Margo! Wow that;s so great to hear/read! I hope you liked the avocado version! It’s a bit different but hopefully still good! Hi Karina. Thank you for all of your hard work and wonderful recipes! I would like to know if you think this would be good with just pasta and not the Zoodles? Additionally, any idea on how it would play out in terms of how much pasta to use for the recipe if I did substitute? Thanks in advance and keep up the great work. This is the best tasting thing I have found on Pinterest! It was delicious! This will be my lunch for the whole week with no guilt! Could you swap out cream for greek yogurt? I made this for dinner and it was a big winner for me and my husband. Well done! I found this recipe through Pinterest and tried it tonight. It was so delicious! Even my picky eaters loved it. This is probably the first recipe I’ve EVER made that actually turned out looking like the picture. I’m excited to try it with fresh herbs next time. Thank you, this is definitely a keeper! 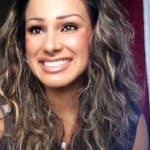 Here’s my website to check out the article: http://www.4hourbodygirl.com it will post on Tues. Nov. 3rd unless you have some objections. Hi Heather! I’m so glad you liked it! I don’t mind if you post one of the pictures of this post with a link back to the recipe on my blog, instead of posting the recipe up on your page 🙂 Looking forward to seeing your post! Sounds interesting! This looks delicious! 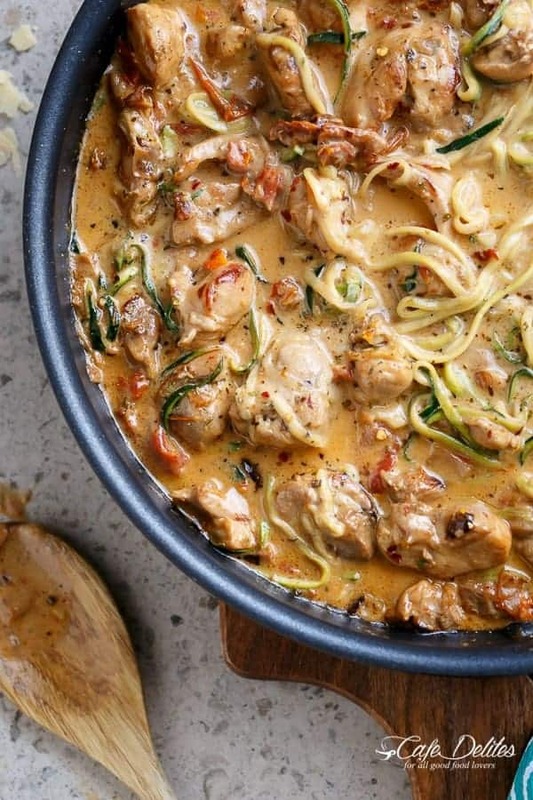 Do you think spaghetti squash could be subbed for the zoodles? Yes definitely! It should turn out delicious! I have a question: I’m living in the UK where cream and half and half don’t exist. They have what’s called single cream and double cream but they are rather thick. Do you have any clue if I could substitute either of these for the cream in the recipe? Because I SO want to make this!! I think even my kids will love it! Hi Sara! I’m sure single cream should work fine in this recipe! Any cream would work really well. I have used a really thick cream in the past and found it becomes thinner in consistency during simmering. If not, add more stock or water (a little at a time), and see how you go! Loved this! Always looking for new recipes to use my spiralizer. Very yummy, and oh that sauce! Will definitely make again! I wanna jump into this pan head first! You and Nagi must be on the same wavelength with the sun dried tomatoes! 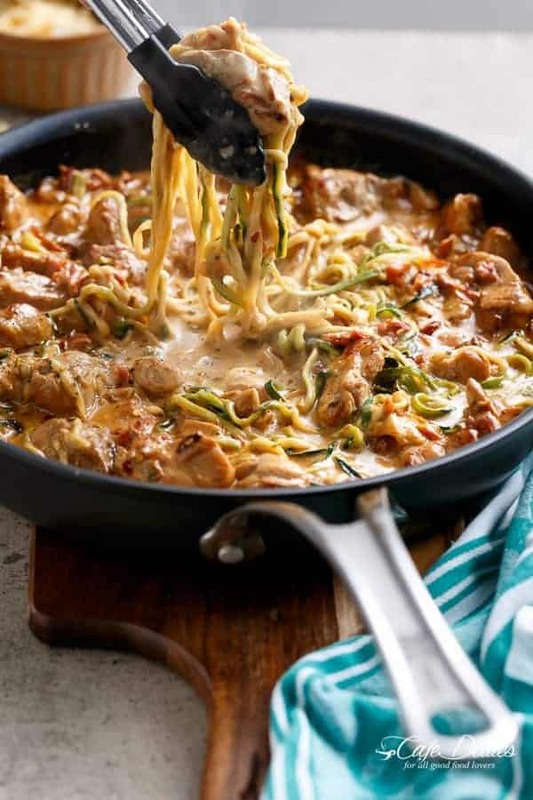 This looks fantastic and I like the zoodles are added at the very end so it doesn’t get mushy and all watery.